Departure Point: Rome. 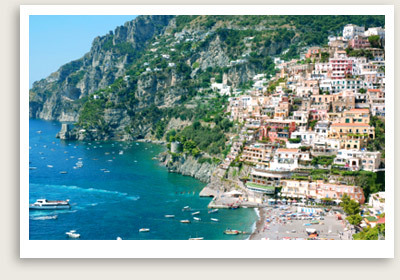 Also Naples or Sorrento. Other departure points available. Please inquire. Pompeii & Amalfi Coast private tour Includes: This Pompeii and Amalfi Coast private tour includes private transportation, entrance tickets to Pompeii, service of expert guide for Pompeii, services of driver-guide, taxes, tolls, and parking. A great day tour from Rome featuring Pompeii and the Amalfi Coast. Pompeii and the Amalfi Coast private tours from Rome is one the best tours one can do from Rome. Your English-speaking tour guide will first take you to the lost city of Pompeii. Thirty feet of hot mud and volcanic ash buried this Roman city completely when Mt. Vesuvius erupted in 79 A.D. You will have a detailed private walking tour of this once-prosperous trading center, established in 12th century B.C. With your private guide to this magnificent Roman town, you will explore its streets and squares, public buildings (temples, spas, theaters and the amphitheater), storefronts, houses, pizza parlors, and other artifacts from Pompeii’s heyday. Next your private tour of Amalfi Coast and Pompeii will take you through the Amalfi Coast, whose stunning views will wow you. You will stop in picture-perfect Ravello or Positano, a classy resort town with trendy boutiques, alluring cafes, and a nice beach to get your feet wet. The last destination of your private guided tour from Rome is Amalfi (time permitting), where you can visit its cathedral, dedicated to St. Andrew.